This evening I decided to mix up a quick batch of Tuna Cakes. It's been a while since I made them. I love eating cold leftover tuna cakes the next day for lunch. 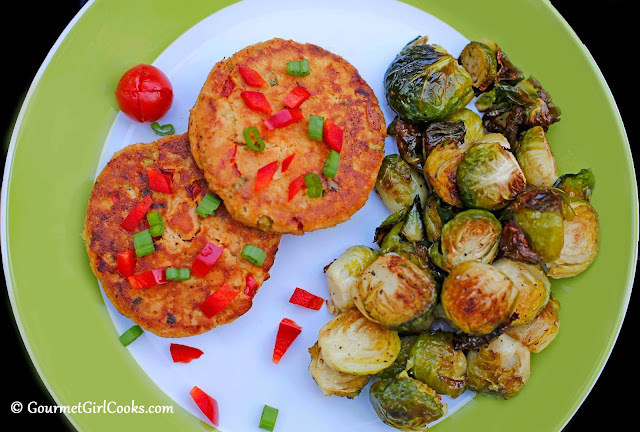 I served the tuna cakes alongside roasted fresh brussels sprouts that I trimmed, halved and oven roasted after tossing with a bit of olive oil, sea salt and freshly ground black pepper for about 25 minutes at 375 degrees F (tossing them a few times while cooking to brown evenly). While the sprouts were cooking, I mixed up my Tuna Cakes and sauteed them in a skillet on the stove until golden brown. It was a quick and easy low carb meal. I used finely grated Parmesan as a binder in place of bread crumbs and they worked beautifully. I snapped a couple photos below and included the easy peasy recipe. You can tweak the ingredients to suit your own taste or to use what you have on hand. This also works well for canned salmon, too. Enjoy! Combine all ingredients (except for oil) in a bowl until combined. Divide mixture equally and shape into 4 patties, adding additional Parmesan as necessary to form into patties. Heat oil in a 10-inch nonstick skillet over medium heat. Add patties and cook 5 to 6 minutes per side or until golden brown. I usually use Wild Planet tuna. You can use either chunk light or albacore. You could use ricotta or cottage cheese in place of the mayo and if you eat bread crumbs you could try that as well. Thanks!